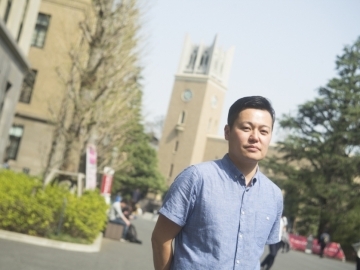 Waseda University has established its mid-long term Waseda Vision 150 in which one of the goals aims at becoming a leading university in Asia. Among the 13 undergraduate schools at Waseda, seven currently offer degree programs taught in English. In 2004, the School of International Liberal Studies became the pioneer at the University to offer such English-based degree programs. Six years later in 2010, the School of Political Science and Economics, School of Fundamental Science and Engineering, School of Creative Science and Engineering and School of Advanced Science and Engineering started offering them too. Finally, in 2011 and 2017, undergraduate schools offering English-based degree programs were expanded to the School of Social Sciences and School of Culture, Media and Society respectively. 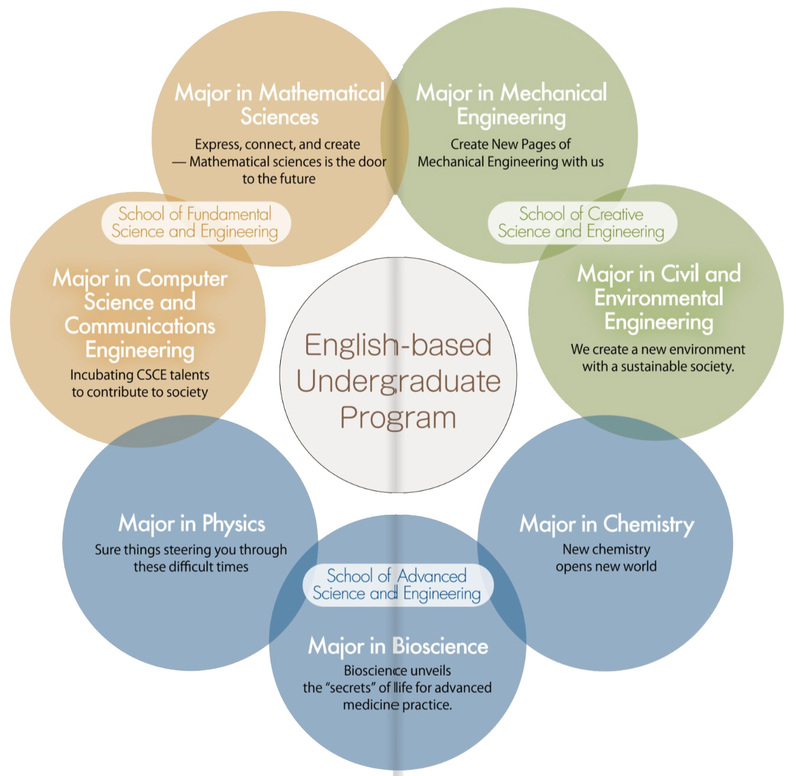 English-based undergraduate programs were originally designed for international students and most would start their first semester in September. 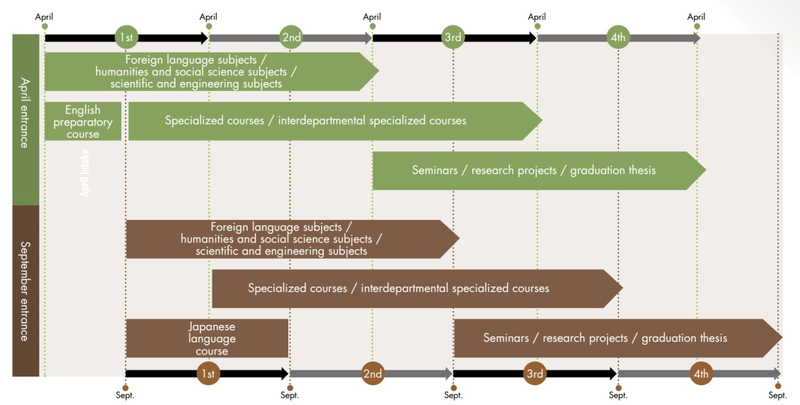 However, as the undergraduate schools at Waseda have been seeing more and more domestic student enrollments in their English-based degree programs each year, some schools have newly designed English-based undergraduate programs in which students, particularly domestic students, can start their academic year in April. The three schools of engineering mentioned were one of them and students can now start their first semester in April instead of September starting 2018. In the following section, we will take a closer look at the English-based undergraduate programs offered by the Faculty of Science and Engineering. All three undergraduate schools at the Faculty of Science and Engineering namely 1) School of Fundamental Science and Engineering, 2) School of Creative Science and 3) Engineering and School of Advanced Science and Engineering have offered English-based degree programs aimed at international students since September 2010. For domestic students considering taking an English-based undergraduate degree with one of these schools, they are recommended to join the April intake starting 2018. This is because the course structure for the April intake has been slightly tweaked to help students gain a better foundation of the English language as well as to get a better grasp of the technical language they will be using throughout their undergraduate studies. These students will then join the September intake in the second semester which consists of mainly international students and returnees from overseas. In the newly revised curriculum, students can now choose one out of the seven majors offered by the schools that also includes substantial coverage from its other two neighboring majors. The first characteristic of the engineering-related undergraduate programs is that all classes including lectures, seminars and lab work will be conducted entirely in English. Students from the April intake will take English foundation classes in the first semester and introductory classes of subjects across various disciplines in first two semesters. They will take similar classes with students from the September intake in the second semester and choose a major at the end of the first year. The second characteristic is that the part of the curriculum adopts a quarter system (i.e. spring semester will be divided into spring and summer quarters and autumn semester into autumn and winter quarters), with each quarter spanning from 9 to 10 weeks. Adopting a quarter system allows students to take part in overseas programs in the quarter term that they have no classes. For example, second-year students are recommended to participate in overseas summer programs in the summer quarter (from June to July) which is followed by the summer vacation (August to September), of which no classes are planned for. It is crucial that students utilize this four-month break for self-development and foreign language skill improvement in order to become a scientist, engineer or researcher that could communicate and exchange research findings with experts in related fields from around the world. 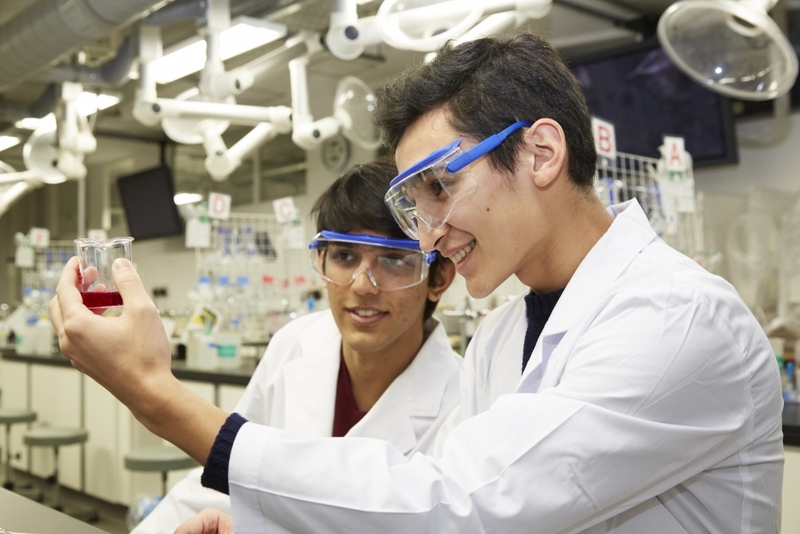 The third characteristic of the program will allow domestic and international students from both English-based and Japanese-based undergraduate programs to work together on their graduation thesis by putting them in the same research lab. This will give domestic students the opportunities to practice speaking and giving presentation in English, and promote exchange and communication between domestic and international students, fostering a global mindset among the students. Aoba Ohta. First-year student at School of Advanced Science and Engineering, majoring in Bioscience. Q: Why did you decide to enroll in the English-based undergraduate program offered by the Faculty of Science and Engineering? 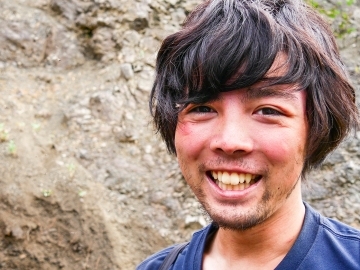 In total, I have lived overseas for about eight years and in Japan for about 10 years. I like it how in Japanese universities, you can pick a major and concentrate intensively on that major. 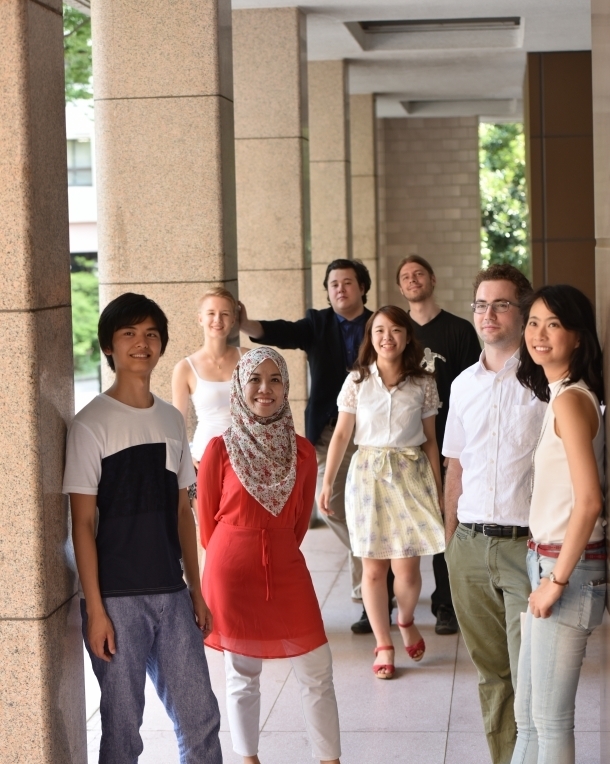 When I knew that Waseda University offers English-based undergraduate programs at the Faculty of Science and Engineering, I considered applying for it because I feel that I can not only learn and study together with Japanese students but also with international students of diverse background. 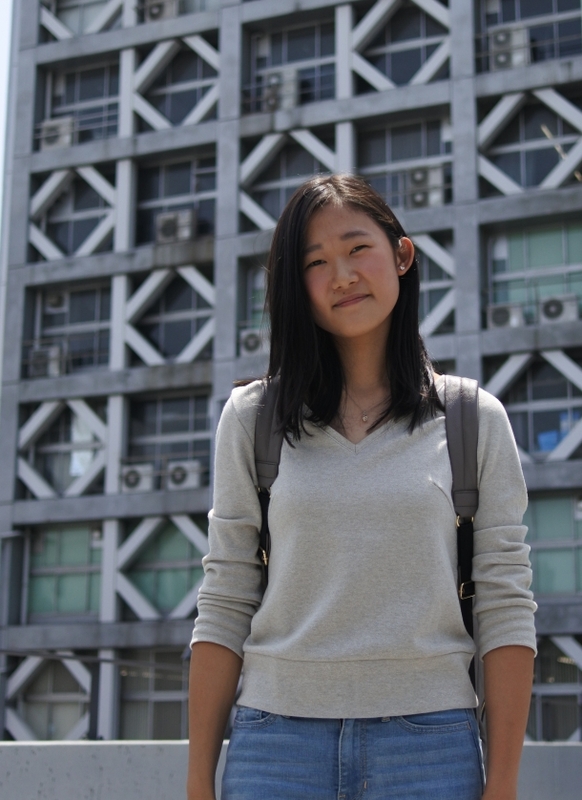 While I did consider applying for the Japanese-based degree programs, I went for the English-based programs because I want to pursue a master’s degree overseas after doing my undergraduate studies. By doing my undergraduate degree in English, it will better help me adapt to the classes overseas as I would not have to relearn all the technical terms in English. Q: Could you tell us more about the undergraduate program? In my first semester, I had to learn the essential technical terms that I would be using throughout my undergraduate program in English. While the professors are really patient and kind, learning the terminology in English requires much effort. When I was studying in the U.S, students do not just listen to the teachers but there is always an on-going interaction between the teacher and students in the class. Personally, I prefer the U.S style over the Japanese passive learning style. 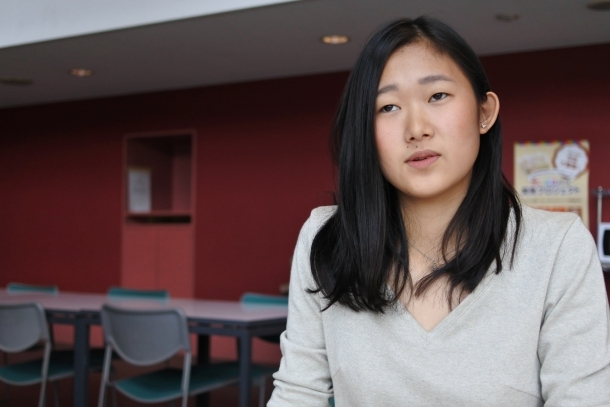 As such, I thought that the English-based program would better suits me because there would be more international students and the classes were likely to be more interactive. 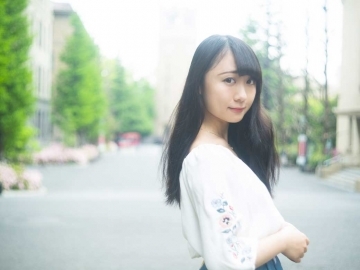 Q: What do you do at the Waseda outside usual classes? Among the students that are in the English-based degree program, there are returnees like myself, students who took internationally recognized examinations or did International Baccalaureate (IB), as well as domestic students who came from Japanese high schools and have never been overseas. I enjoy having lunch and interacting with them to learn about our differences and similarities. I am also a member of an official student tennis club called Laissez-Faire T.C. In addition, I also participate actively in Model United Nations (MNU) and student debates outside class. Q: What do you wish to pursue in your undergraduate studies? At present, I am still unsure of which professor’s seminar I want to join yet. However, I do have a strong interest in immunology and neurology. Whichever major I choose, I want to be able to learn it in both English and Japanese. I also want to be someone who can communicate and convey messages to a wide audience in both languages. <<https://www.waseda.jp/top/en>> doesn't support your system.